k1creativeconnections | Kindergarten & 1st Grade: Discovering how creativity opens our minds! Kindergarten & 1st Grade: Discovering how creativity opens our minds! Today miss Kelsey had the students finishing up their parrots-they got the clay parrots, now fired and ready to be painted. We also had different stations for the students-Kelsey showed them the plasticine clay, which was a substance a bit different from regular clay, but the class had a chance to use it and mold it to shape their characters. Others worked on various other options; as it becomes more evident that by incorporating choice and giving students options to work on the projects that interest them most, they will be more persistent and engage in that project longer. We saw that today, as students created new clay pieces, finished their parrot drawings using color and shapes, as well as many of the boys collaborating with one another in the process of building a classroom ship. While they had a lot of time to create, Kelsey made sure that they also did a lot of refelcting as well. Near the end of the class we have been doing “walk the plank” activities where they take turns answeing questions related to what they learned and what was challenging by “walking” on a plank (made of styrofoam). It is in the reflecting part of the art making that the learning occurs. Many students now have a better understanding of how to work collaboratively and as a group. One student in particular, who at the beginning of the semseter would only work with black marker, now can use color and justify his decision making. “I used these colors because my parrot is really scary, look at his teeth.” And: “This other parrot is colorful because he is a friendly parrot. You can tell he’s happy because of the colors.” While as before he was creating and not knowing why, he now has vocabulary and intent in his art making. Teacher: “Why are they all different? A good example of student explaning the decision making behind the process. At times the pieces fell apart, but they were resilient and persisted to make further improvements. Today in Ms. Julie’s classroom, eighteen pirates worked collaboratively to create a pirate ship from cardboard, tape, construction paper, and brilliant minds! 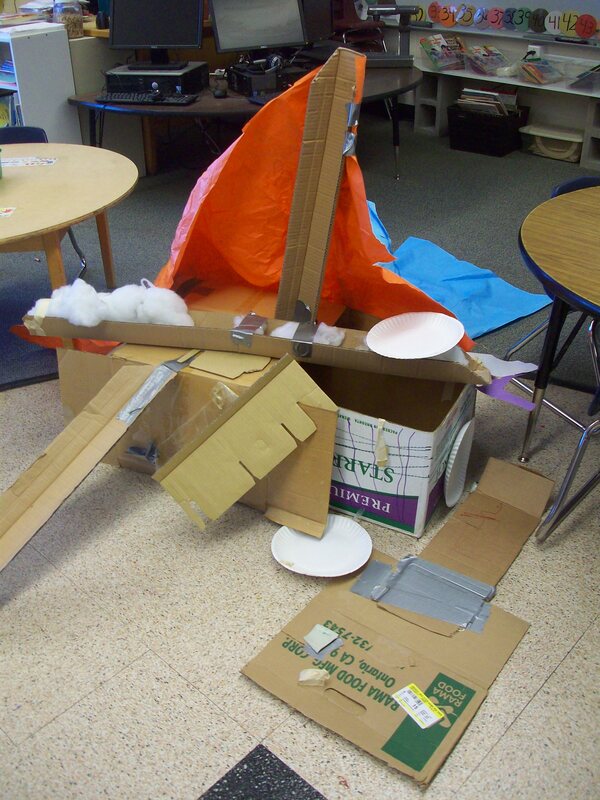 The students built oars, rudders, flags, a pirate deck, and a mast–all using their own hands, minds, and creativity. They’ve definitely mastered the art of trial and error because the process was difficult yet SO rewarding for them. The students understood the collaboration aspect of the project and became a team! Students were taping, gluing, creating several colorful flags, canons with smoke, wooden planks, and a sail–all on their own! After personifying sails (with the flapping of our shirts) and rudders (by running around the room in a back-and-forth motion), the students were excited and anxious to begin. The students were given more freedom than any previous lesson and when we set them loose, the class divided themselves in a manner so efficient, mature, and productive that we were almost taken aback! Their eyes grew twice in size as the mountain of cardboard material was unveiled before them; for the entire class, the students were focused, driven, creative, and inspired. It was my favorite class to see, so far. Today was miss Kelsey’s turn to teach, and we had a lot of fun and energy in today’s class. Kelsey showed us pictures of different kinds of parrots and explained to us how the parrots have multiple colors, shapes, and features. The students were really impressive today, in demonstrating their abilities in the 2-d and the 3-d art works. One explanation of why their art work has improved so much is that they have had many weeks to explore and practice with materials like clay and colored pencils, which gave them some guidance on how to work the materials and use their thinking to shape their final piece. Today we completed both a drawing of parrots which included a lot of variety and color as well as a clay parrot which we will fire and then paint. At the end of the class, they even got to “walk the plank” and interview one another on their parrots and the students loved the role playing! Talking about student art: this parrot is fairly unique. But it’s important for the student to talk about it and reflect on the characteristics. Student talking to Kelsey about the various shapes he is using in his work. Student giving explanation about the parrot; imaginative but a creative response. Good observation by the student. They had to use their critical thinking skills as well in creating these parrots. This student used the pencil as a way of creating a hole for the eyes. Applying prior knowledge to this week’s lesson. [Part 2] Playful, Precocious Pirates! Captain Eun Soo led the students through a blue, blanketed maze–and the students’ imaginations ran beautifully wild. According to the students, sting rays, sharks, and even a beluga whale or two were spotted in the ocean adventure and stories of what they “witnessed” flowed endlessly. This week, students finished up circling the “centers” from last week, (including a hat, hook, sword, eye patch, and clay station)! Once again, the students were excellent at collaborating with peers. Students shared techniques/materials/ideas with one another and were inquisitive in their process. The students continued their experimentation and we saw even more risk-taking, problem solving, and adventure in their creations and work processes. This was exciting to see and several of the students confidently even asked for images of their prized work. One student explained that she used the red and yellow colored acrylic paints because she wanted her hook to “look Chinese” in nature. She explained to the class how this was her intentional artistic choice- something our class has been talking about since Day 1! Tape, glue, and paint were once again combined in unique ways that the students discovered. One student found that by putting duct tape over acrylic paint, the colors blend in a new way which she hadn’t seen before. Clay was the most popular material, yet again. Students were mesmerized for the entirety of their time at the clay station- pinching, squishing, poking, stretching, and simply molding seemed to be the high light of their class. These pirates have the most amazing imaginations- we are learning from them each day–how often do you hear that a beluga whale is on the loose in the art room?! This week Mr. (“Captain“) Eun Soo led the students in a “centers-based” activity filled with handmade hooks, eye patches, clay, pirate hats, and MUCH enthusiasm. 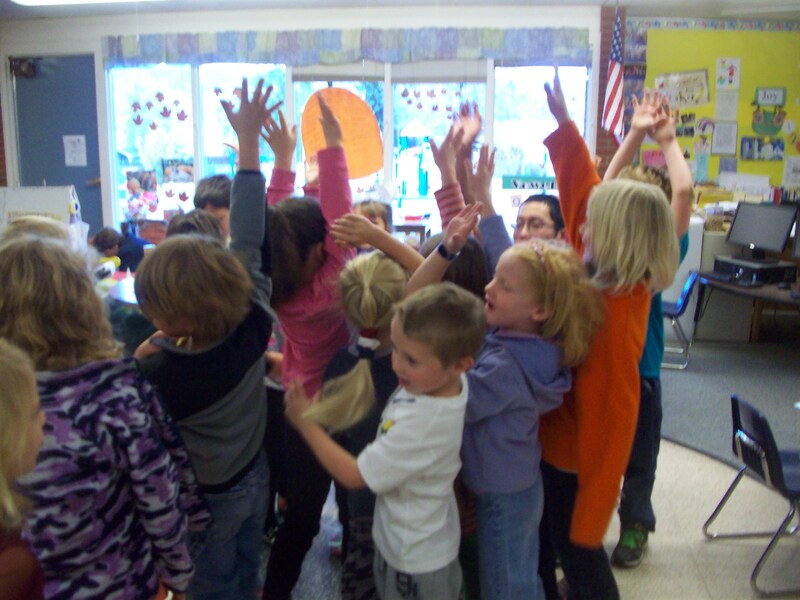 Julie’s classroom quickly transformed into an ocean full of pirates, singing, humming, and working away! Captain Eun Soo leading a brainstorming activity- reminding students that anything is possible to create! The students were enthralled by the texture and several simply spent the entire time at the station feeling, pressing, pinching, and scratching it; this exploration was important to their understanding of the clay’s purpose, memory, and–above all else–the clay’s existence. Students were especially quiet at this station–we saw their minds turning with each interaction their little hands made with the material. Once the pirates’ feathers, chopsticks, paint, newspaper, beads, string, and clay were flying in hands, Captain Eun Soo led the class–adorned in their newly constructed costumes–to our next door class neighbors to “scare” the students with pirate get-ups and voices. One student responded to Mr. Eun Soo’s question of his/her favorite part of the class as the “scaring time” next door. The students loved showing off their creations and seeing emotional reactions from something that they had put together themselves! 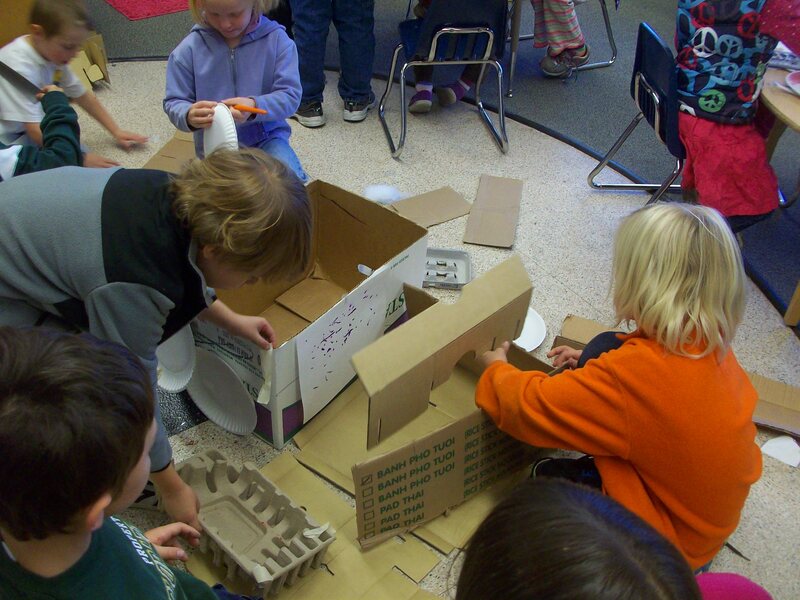 Students were given the chance to explore three different stations and encouraged to both play and construct. Little instruction was needed this lesson because the students have gradually been accumulating several techniques in the art classroom such as mixing acrylic paint, attaching mixed media using string and glue, and combining nontraditional objects and materials to create the vision they’re imagining. The students executed their costumes using problem solving strategies such as trial and error, stretch and explore, and experimentation. At times, frustrated students had to re-work their design (the tricky eye patch in particular!) multiple times until the functionality of the piece met the standards of their creativity to which they were dearly attached. The students this week improved in collaboration skills by aiding one another taping, gluing, tying, and attaching their neighbor’s piece in times of struggle! Looking forward to next Friday’s continuation of stretching/exploring in Julie’s classroom! Stay tuned. Students got the chance today to work with some mixed media and collage materials. The theme was “our family tree”, as students were to think about who or what is important in their lives, and to connect that into making a tree-collage with various 3-d materials including ribbons, paper, plastic, cut-out pieces of cardboard, and other mixed media. The students learned how to use a glue gun to attach some materials that would not stick with glue, and got to express parts of their personalities through their own “artistic tree”. After they finished, they had a chance to play “musical chairs” and observe each others’ work, as well as reflecting on what qualities they liked best. The students were active and engaged, and they learned how to experiment with collage, which stretches their thinking about the possibilities of combining 2-d and 3-d processes. Here students were scratching the tree to feel textures. This was a way of brainstorming and giving the students some hands-on activities so that they can recall the textures and how the tree felt, and it would translate later in their artwork. It is important at this level to find things that the students would be engaged in, so that their art making is reflective of their engagement levels. A work in progress from a student. We see a wide array of materials on the table for their use, and they had the freedom to paste or use hot glue to attach them. He experimented with tissue paper and explored some options with that. After seeing that his tissue was accidentally in water, one student rubbed in on his sketch book and saw that it made a water-color like mark. Some of these “happy accidents” can become a way to progress and have new discoveries! He used that kind of playfulness to further develop his tree, adding on elements that were not typically seen in a tree. By giving students some freedom and some guidance, they can solve problems using their hands and their minds. Many of the students used the tree as a way to show characteristics of their families or friends. And other students created more experimental, abstracted trees that showed some of heir own personality. “Some things stick better if you use the hot glue stuff” Another girl in our class remarked. She saw that while paper was easy to stick onto the paper, 3-d objects like plastic apples and pears were not so easy to stick on the tree. By learning different use of materials, students will be better prepared for future lessons and to solve their own art-decisions. Kelsey doing a demo on the hot glue gun and the assignment. For our class, we use some time for a demonstration and lecture, and then give the students enough time to go and explore those materials. Reflection is also consistent in our class, as students share with us and with each other how they make their artwork, and what kinds of things they learned from the lesson. Next week we will be doing some role-playing with the students…How about some pirates? This week, the artists of Ms. Julie’s class experimented with the ways water color and colored pencil can unite in an artwork! Students once again utilized their sketchbooks as they practiced the way artists “outline” and “plan” details of art to make the final product more pleasing. Students work on planning (in sketchbooks) as a key step in the artistic process! Collaboration was another element that was introduced this week, as the students worked beside their peers on an oversized watercolor. 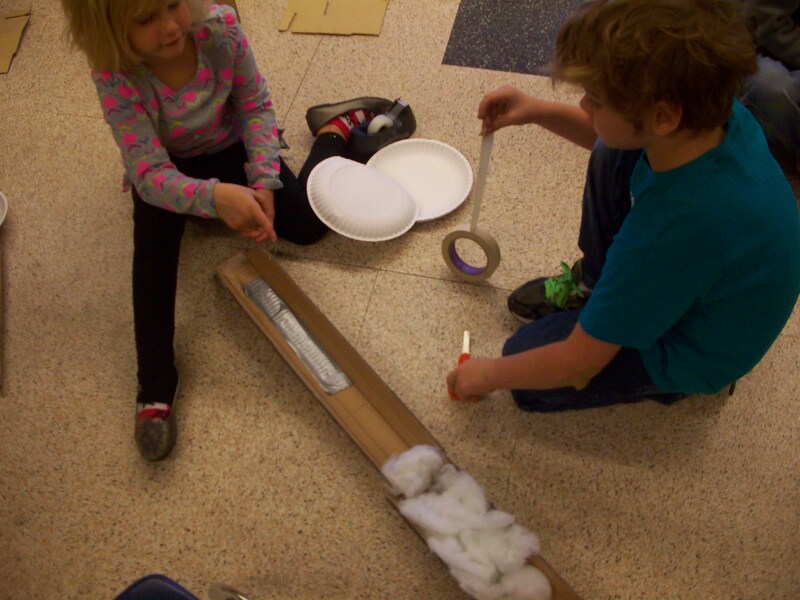 Students were excited and very vocal about the way that they were learning through experimentation. As Mr. Eunsoo read a story aloud, the students were encouraged to develop their ideation and envisioning skills. This week’s paintings helped the artists gain experience imagining characters, developing problem solving/posing strategies, transferring ideas to paper, and continuing to creatively experiment with new materials. Today was Miss Kelsey’s turn to teach-and the student were exposed to a new medium-watercolor! Kelsey reviewed the primary and secondary colors we went over last class, and reminded them that painters use these colors to create master paintings. The students were really excited to try out painting with watercolor this week, and set out to embellish their sketchbook covers. We wanted them to feel like they “owned” their sketchbook, and wanted to make sure it was unique to them with their own personality showing through the paint. It is important to note how many students recognized the difference between our acrylic paint that we used last week and the watercolor that Kelsey introduced this week. They realized how fluid the paint felt, and they caught on to the technique fairly quick. In our class, the students learn essential studio habits that will be helpful for them as they progress in our class. Kelsey made sure that they were organized and efficient, especially when she told them to clean up the watercolors for the next activity. Keeping the room organized not only helps us, but for the students’ learning as well. Kelsey taught the class about “reading” an art work today. The students learned what a narrative is, and how your point of view might not be the same as another person’s point of view. They were really engaged and observed multiple characteristics and features in a painting; they pointed out some things that even we did not notice at first! To apply this new concept of telling story through painting, Kesley led them through a sketchbook assignment that would depict the student with a friend or a family member. Some of these pictures were very well developed, but the most important part is that all the students could intentionally show what it was in their minds onto a drawing. Even in the first two weeks, Kelsey and I have noticed improvements in how they will commit to an activity and stick through it. We like to see our students engage and persist through an artwork, even if the result isn’t what they pictured it to be in their minds originally. Finally, the students had a time to “act out” their narratives with a buddy-this was helpful because Kelsey got them to interpret their own drawings, which were much more meaningful to them than those paintings they’d seen before. The class was well-behaved and enjoyed themselves, as they explored a new medium this week and found out new art terms as well. We hope to keep them interested and stretch their imaginations like this class every week. Today’s lesson revolved around primary and secondary colors. Mr. Eunsoo guided the students along in their color mixing techniques and the class discovered the “magic” of mixing two colors at a time. The Two Color Rule proved successful in almost all of the students’ paintings–demonstrating their knowledge of how to create secondary colors! Students began the class by shouting “I AM AN ARTIST” from behind Fred the Frame–this small step began the art making process with confidence and excitement. One of Mr. Eunsoo’s rules was to have fun–the students were masters of this and were smiling immediately.